I’m in London this week for work, as our regular readers know, and I’m trying a variety of dishes I’ve never seen in the States. My first lunch Monday was in a pub, albeit a newer one that looked more tourist friendly than old-world London. While everyone else got a version of breaded fish in a bun called fish fingers, I went for the most British sounding thing on the menu, Fisherman’s Pie. Even my British hosts weren’t sure exactly what it would be, except to say it would be covered in mashed potatoes, which it was. 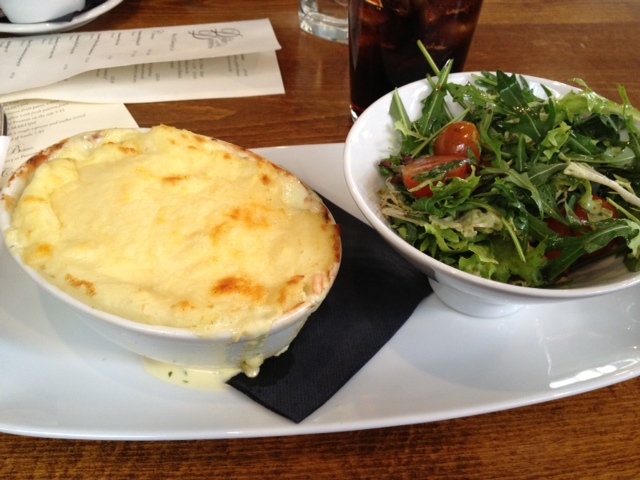 My fisherman's pie, with a small salad. Beneath the potatoes, which were covered with a melted cheese of some sort, were pieces of salmon, cod and perhaps something else, all in a cream sauce. It was quite tasty although I did not eat most of the cream sauce and left about half the potatoes and cheese. Figuring out the calorie count for that seems impossible to me. I put in mashed potatoes and the fish in my LoseIt! app and came up with 475 calories, but I’m thinking it must have been more.